Ramrod straight and imperious, Queen Mary was a renowned kleptomaniac, demanding pieces she liked from the grand houses she visited. During the war she took over Badminton House with 55 servants, forcing the Beauforts who owned it to live in two rooms and watch aghast as she had their trees felled. She enjoyed being read to, sometimes for up to seven hours at a stretch by a hapless lady-in-waiting who was eventually sacked for lacking fortitude. Engaged to be married to Queen Victoria’s eldest son, she stepped down a brother after he died of flu, and married George V whose main excitement in life was stamp collecting. 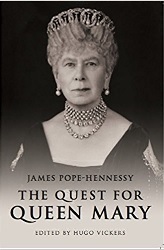 She treated her children with coldness, typical of the day, which sent the Duke of Windsor into the arms of Wallis Simpson and rendered King George V1 into debilitating nervousness. Prince George, Duke of Kent, had a drug problem and strings of affairs with men and women, including Barbara Cartland and the later Duchess of Argyll; Prince Henry, Duke of Gloucester had a scandalous affair with Beryl Markham. Three of her sons including the young epileptic Prince John predeceased her; and she died weeks before Queen Elizabeth’s coronation. Born 26 May 1867 11.59pm London she was a Sun Gemini with Moon Jupiter in Pisces trine Uranus, which might have made her fun. 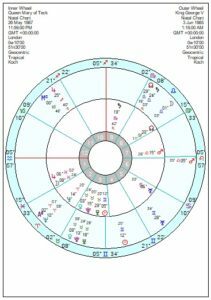 What dominated her chart, however was Saturn in Scorpio opposition Pluto square Mars in Leo – and that is hard, unyielding, bound to a life of duty. Her Uranus in the 5th house of children does hint at the wayward bunch she produced. Her Venus in Taurus would give her a love of beautiful things. Her husband George V, 3 June 1865 1.18am London, with whom by all accounts she had a steady marriage, was not dissimilar to her being a Sun Gemini with (also like her) Venus, Pluto, Mercury in Taurus. Though it was hardly a match of great passion since both their Saturns fell in the others 8th house of intimacy. Their relationship chart had a chained-together composite Saturn opposition Pluto Venus square Mars opposition Jupiter – an overload of duty, aggravation, the forced sacrifice of individual identity and a good deal of largesse. Mars in the composite 5th might also point to boisterous children who provoked anger. Scraps from a bygone era. But she was a powerful influence in Queen Elizabeth’s childhood, perhaps re-enforcing the obsessively dutiful Saturn in Scorpio they both share. 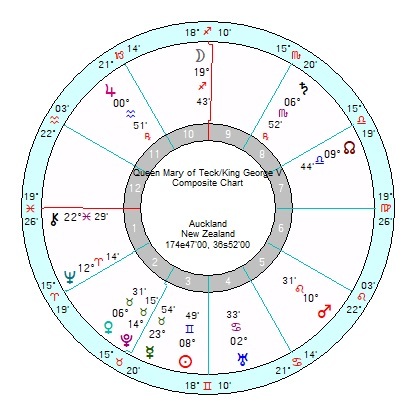 Though in HM Queen’s case it is conjunct her midheaven and devoted to work first and foremost. 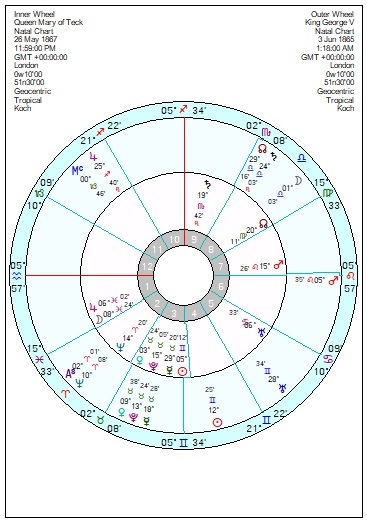 The Queen’s Taurus Sun was conjunct Queen Mary’s Venus and the Queen’s Venus in Pisces was conjunct her grandmother’s Moon Jupiter so there would be affection. But that relationship chart was tough going with a composite Sun, Uranus, Mars, Moon opposition Saturn square Jupiter – not exactly playful.